Yesterday I featured my favourite gifts out there for the men in your life, and today, it's all about the women. It definitely feels to me that V day is marketed more towards women, especially since that quite rude day appears a month later where men like to push for a certain meal and a little something else in the evening. It gives the illusion that Valentines day was more for us ladies. I think it's a load of pants, however a little gift wouldn't go a miss right? 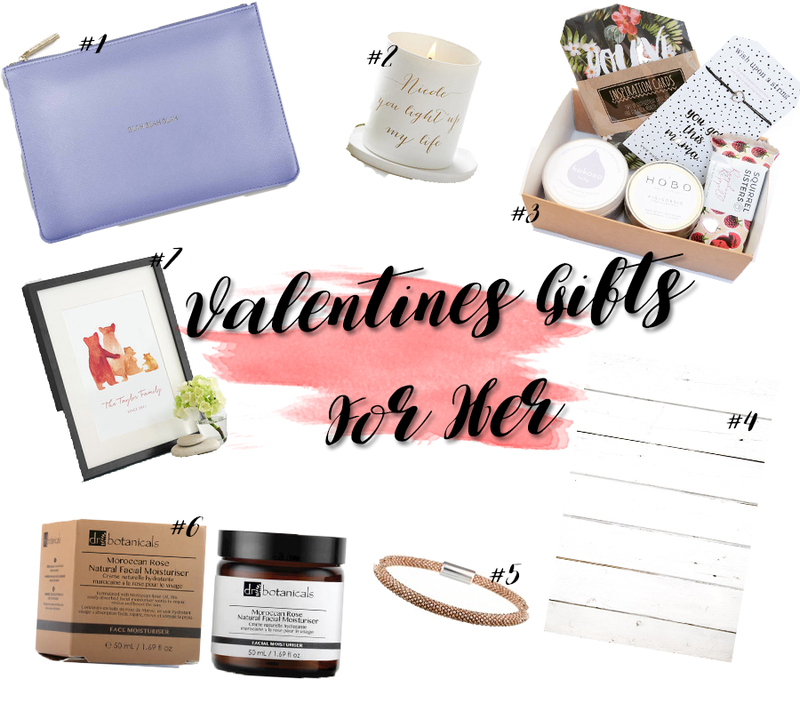 Here are my top picks this Valentines, with something for everyone. Kate Loxton Perfect Pouch - Oh my goodness, firstly, think of the insta snaps! (All for the cause) Secondly, just how beautiful is this. I think a pouch is so handy if you don't want to convert to a changing bag, you can stick with any back you already have and just have a separate pouch to keep all your essentials in. And what better pouch than this beautiful cornflower blue one? Personalised Candle - Most women I know love a good candle. It's one of those 'can't go wrong' presents. What makes it that bit more special and thoughtful however, it the way you can personalise it to add your own little message. Women are usually horders and throwing away a candle pot is a no-go (I mean how many uses do they have) so getting one with a unique message will give us an extra reason why we just NEED to keep it. MamaMe Box - These subscription boxes are divine. Take it from a lady who has had her fair share of subscription boxes, this is hands down the best. Any millennium mother will be thrilled to receive this, I was lucky enough to get my hands on their January box (review coming very soon) and I haven't looked back, if someone were to buy me a one off box, it would make a very happy me. Photo Backdrop - Capture By Lucy do without a shadow of a doubt, the best back drops on the market. If the lady in your life is a blogger, then you can thank me later because you'll be earning major brownie points with this one. Her white floorboard design is a must, and I have a sneaky suspicion it may be awaiting me for Valentines this year. Browns Rose Gold Bracelet - Wow oh wow, how beautiful is this little number? I'm not usually a jewellery kind of girl, but I do think it's important to have some staple pieces in your collection and this is most definitely my favourite at the minute. Rose gold is so on trend and this beautiful mesh design ticks all the boxes for me, it's simple but chic. Personalised Family Print - I love a sweet family print, they're all over at the minute but I struggled to find one that was beautiful as well as still being quite unique. I didn't want to walk into someones house and find the exact same one. That's when I stumbled across this beautiful bear design by The Drifting Bear Co on NOTHS, it's adorable and I am sure anyone would love to be gifted this, this year. Make sure you check out my gift guide for him. Love the idea of the photo back drop. We don't do valentines presents though so I have to keep dreaming! That backdrop is such a fab alternative gift! I also love the sound of Dr Botanicals Moisturiser! Is this a massive hint to John haha! I really want the bear family thing, saw it last week as a cushion!